BANGKOK, Apr 11, 2018 - (Media OutReach) - As Thais and people around the world gather to celebrate the Songkran Water Festival, Twitter joins in the festive occasion by launching the first-ever #Songkran emoji. People can Tweet with the #Songkran emoji using both English and Thai hashtags. The #Songkran emoji is available from now until 20 April, 2018. 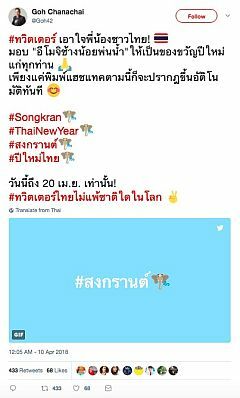 The #Songkran emoji on Twitter depicts an elephant splashing water - paying tribute to Thailand's national animal, and also highlighting the much-anticipated annual water fights between locals and tourists as a symbolic representation of purification and the washing away of one's sins and bad luck. The special emoji will appear whenever the following hashtags are included in Tweets: #Songkran, #ThaiNewYear, *1, and *2. Commenting on the launch, Philip Chua, APAC Public Policy Manager, Twitter Asia Pacific, said "Songkran is an important occasion for Thailand, and also coincides with the New Year for many of our communities in Southeast Asia and around the world. This year, Twitter is proud to introduce a special emoji for the occasion, encourage more people to share in the celebration and to lend a colourful touch to what's happening in Asia!" Twitter is what's happening in the world and what people are talking about right now. From breaking news and entertainment to sports, politics, and everyday interests, see every side of the story. Join the open conversation. Watch live streaming events. Available in more than 40 languages around the world, the service can be accessed via twitter.com, Twitter Lite (mobile.twitter.com), an array of mobile devices, and SMS. For more information, please visit about.twitter.com, follow @Twitter, and download both the Twitter and Periscope apps at twitter.com/download and periscope.tv.